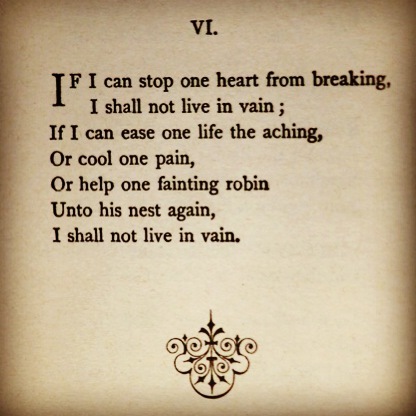 National Poetry Month: I shall not live in vain. I like to personally celebrate this month by making an effort to read some poetry. Years ago that effort was appeased with a complete volume of Emily Dickinson’s poetry. And in 2012, as you know if you read my blog, Emily inspired me to write a book: Dickinstein. As I was writing the book, I reread Emily’s poems and found quite a bit of inspiration there. I even used her poems as introductions to each chapter. It’s easy to interpret the poem as Emily wanting to help bring a dead robin back to life, isn’t it? And it’s those more obvious themes of immortality that are everywhere in her poetry which really helped build a strong plot in my book for me. Throughout the month in celebration, I’ll be posting more poems that I like, along with a few of my own. Do you like poetry? If so, what poems inspire you? What are you doing to celebrate National Poetry Month?